It was only a matter of time, really, once word got out last month that Greg Oden would again need knee surgery, and this time on the knee that hadn't been bothering him in the last two-plus years. But now that Portland has committed to building up by tearing down—the Blazers sent Marcus Camby to Houston and Gerald Wallace to New Jersey in separate trades today, getting four spare parts in return—somebody had to go. That somebody was Oden, who likely wouldn't have been back when he became a free agent after the season anyway. The Blazers are only 3 1/2 games out of a playoff spot, but if their goal is to hit the reset button now, then this is just the right time to part ways with Oden. 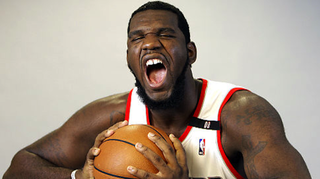 Somehow, it's now been five years since Portland made Oden the No. 1 overall pick in the draft. He's played in just 82 regular-season games in all this time, plus six more in the playoffs, and none at all since Dec. 1, 2009.